Turns out they had. In Europe, composting toilets have been around for generations. Often called “waterless toilets”, they are installed in homes, offices and government buildings – wherever a toilet is needed. Contrary to a popular misconception, there is no unpleasant smell if a composting toilet is installed properly. 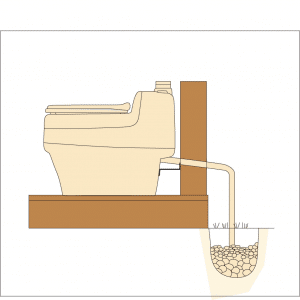 North Americans have been much slower to adopt composting toilet technology. However, fresh water is becoming a scarce resource in many areas. It seems wasteful to flush away gallons of pure drinking water every time we use a toilet. In 2005, Americans flushed away 123 billion gallons of water, according to a U.S. Geological Survey report. This is a big step forward. The relative lack of fluids in the storage tank helps eliminate odor. Complete and rapid composting occurs easily. Further dehydration over time allows the solid material to shrink dramatically (just like a compost pile). 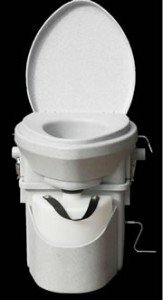 A small self-contained composting toilet can hold a surprising number of “uses”, meaning you do not have to empty it frequently. Most of the older composting toilet designs hold the urine and solids in one tank. Water evaporates with the aid of electric heat, with the same odor free results – at least theoretically. In practice, you must be very, very careful not to introduce more liquid than the unit can evaporate. Peat moss, coconut fiber, biological compost starter or other organic material is often added to the composting toilet to initiate and aid the composting process. In some toilets the solids are rotated, to speed up composting. With some simple home-made units you just cover fresh material with a layer of sawdust. 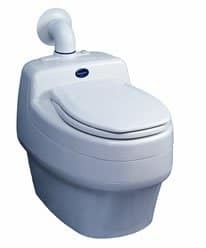 Commercially available composting toilets use fans to dry out the contents and prevent odor. These fans are usually very quiet – 30 db to 40 db (which is between a whisper and a refrigerator in volume). They run all the time, 24/7. The fans pull air from the bathroom area, through the composting toilet and out a pipe to the outside. You never smell anything, even when sitting on the open composting toilet, because the fan is pulling air away from you. Any odor is exhausted, and it cannot waft up into the room. When the solids bin fills up – and this can take between a few weeks and years depending on the type of composting toilet and how many people use it – you empty the already well-composted material into a suitable bin or container so it can “mature”. There should be little or no odor at this stage, other than a slight “earthy” smell. Nature’s Head – a compact design suitable for 2 people full time. They are hygienic, inexpensive in the long run and environmentally benign. As fresh water becomes ever more scarce we are sure to see wide spread acceptance of this technology. Please join in the discussion on my blog page! Click here to visit the Nature’s Head homepage. We are very happy with this purchase. We use it in our barn as an extra toilet. There is never any odor. The Separett Villa we purchased in 2016 works perfectly. There is never any odor. It is very easy and fast to empty. You do need a composting bin (or two) in the backyard though. Do the Separett installation instructions require an overflow drain from either the solids or urine container into a qualified drain? I think this would be considered a ‘blackwater’drain thus necessitating a permit to install – The only way we can install without a permit in our area is to have an electric heating element that evaporates the liquids. I am hoping the Separett design eliminates this need. Does it? You need to distinguish between urine diverting toilets like the Separett, and the older non-urine diverting toilets like Sun-mar and Envirolet. Urine that is not contaminated by feces is sterile, and does not pose a health risk. It is not black water (although some local governing agencies remain unaware of this). The urine drain from urine diverting toilets like the Separett only drains urine. It is not contaminated by feces, and is not black water. It typically goes into a gray water system, drain pit, or a tank where it is diluted 10:1 with water and used as fertilizer. On the other hand, the overflow urine drain in non-urine diverting toilets like the Sun-mar, Envirolet, Biolet, etc. drains urine that HAS been in contact with feces. That requires treatment as black water. Those toilets need powerful heaters to evaporate the urine, so no contaminated urine escapes. But the fact that the drain is still there shows that the heaters are not 100% effective, and contaminated urine is draining from the toilet. Heaters are completely unnecessary in urine diverting toilets, as the urine is sterile. No urine diverting toilets have heaters. You may have to explain this to your local authorities, who seem familiar with the older designs from the 1980s, but are unfamiliar with the more recent urine diverting toilets. Coconut coir is only sustainable to the extent that a truck is able to deliver it to you from a tropical location. If you live in the woods, you will have plenty of peat wherever fallen logs are breaking down. Sorry, you are incorrect on both points. The moss on fallen logs is not peat moss, and should not be used in your toilet. Peat moss is from peat bogs, and it forms over thousands of years. Peat bogs gain less than a millimeter of depth per year. Also, The International Peat Society points out that the peat mining process releases massive amounts of carbon into the atmosphere, and the bogs continue to exhale carbon long after the mining concludes. Peat moss is not considered a sustainable, environmentally friendly product. Coconut coir is a completely renewable, sustainable waste product that provides income in poor countries. It does not ship to your address directly from a tropical country. It is imported into North America, then shipped to your address. The accessibility of your address for deliveries does not impact the sustainability of coconut coir. That is an accessibility issue, not a sustainability issue.